Earn $0.26 in VIP credit (26 points)What's This? Get rolling again in no time with our Glueless Patch kit. Unlike standard inner tube patches, there is no gluing required here, just peel, stick, and ride. 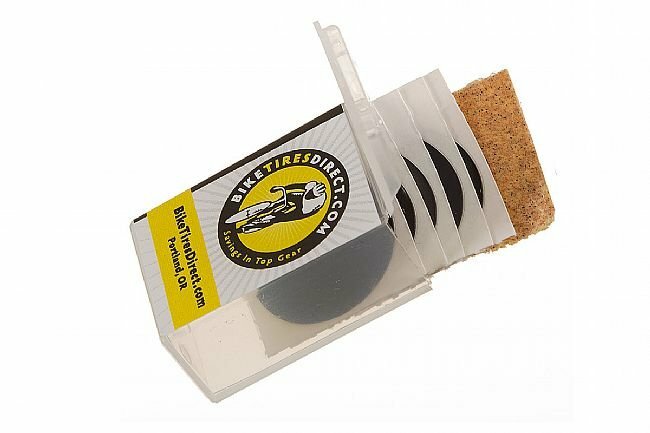 The Bike Tires Direct Glueless Patch kit includes five patches, a small piece of sand paper, and a micro-sized storage case. I had a flat that left a cut in a tire with significant tread left on it. I put the glueless Patch on the cut in the interior of the tire and it has maintained the integrity of the tire and allowed me to continue to ride on the tire. So far the one patch I tried worked. It was easy to apply and has held to date. The case is large. The Park patches are thinner and smaller case. I have very limited space to pack anything on my bike so the more compact an item is the better. Bike patches are easy and quick to use, i wouldn't want anything else when i go on those long buke trips where blowing a tire is always a risk. I have only had to use one patch thankfully but it has held up for a few months now.